This is easily the most requested--and the easiest--pizzas the girls and I make in our little corner of the world. The girls love making them--and eating them. 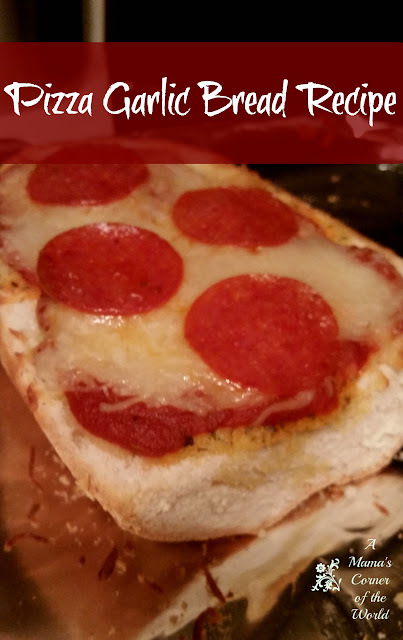 We use this pizza garlic bread recipe for quick lunches, party appetizers, dinner, and sleepover snacks. The crust is an inexpensive, bakery Italian Bread. (Our local Kroger usually offers these loaves for $1 or less!) We top the bread with a homemade garlic butter, a little leftover pizza sauce or even pasta sauce, shredded Italian cheese and a hand full or two of the girls favorite pizza toppings. This Pizza Garlic Bread is a fun "cooking with kids" project--and makes a perfect snow-day lunch if you've planned ahead and picked up a loaf of Italian Bread! Preheat the Oven & Prepare your Baking Sheet. Preheat the oven to 350 F. I generally line a pizza pan or cookie sheet with aluminum foil for easy cleanup. Set up a Pizza Making Station for the Kids. I LOVE this recipe--because we can make these pizzas with leftovers. A few slices of pepperoni, a 1/4 cup of sausage, fresh onions, tomatoes, peppers....I simply pull out some random ingredients, put them into bowls or onto plates-- and the kids are able to create their pizzas. Top the Garlic Bread with Sauce and Toppings. Divide the pizza sauce between the two slices of Italian bread and spread evenly over the bread. You can adjust the sauce to your taste--using more or less to your liking. Top the sauce with shredded cheese and desired toppings. Disclosure: We were not compensated for this post. However, our posts do frequently contain affiliate links from which we may receive slight compensation. I've made this before. My kids love making pizza. They usually help their dad make pizzas. Super easy--and perfect for snow days with our unpredictable weather!